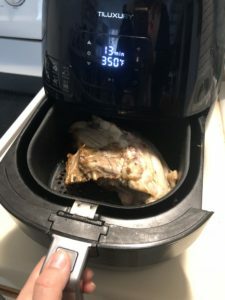 I recently got the opportunity to try out an air fryer. Finally! 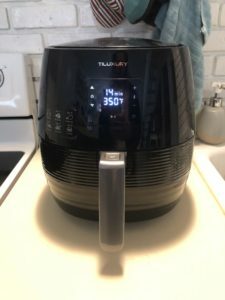 Clients have been telling me how much they love their air fryer. I would just smile and nod, not totally understanding what’s so great about the latest gadget. I brought one home for the weekend, tried it out, and now I’m in the market for one of my own. What’s so great about an air fryer? It uses convection (circulating air) to cook the food quickly and evenly, and makes everything so perfectly crisp. And you can get that crispiness with very little oil. The options for air frying are endless (french fries, crispy brussels sprouts, chicken nuggets, etc), but in honor of the Fall season and out of necessity to feed a large crowd at Friendsgiving, I decided to go with fried turkey breast instead. Most air fryers are not very big. I was working with a 5 qt capacity air fryer so my 5# turkey breast (bone in) had to be split. I tried shoving it all in at once, but the top coil was hitting the turkey and started to burn it. Oops. So it came back out and got cut down the center. If you’re working with the 10 qt air fryer, then you should be able to keep it whole. All I did to the turkey was rub it with a little olive oil, salt, pepper, and chopped poultry herbs (thyme, rosemary, and sage). From there, I just popped it into the air fryer (skin side down). I just let it go for about 15-20 minutes. Next, I turned it over and cooked for an additional 15-20 minutes. Once it started to reach an internal temp of about 150 degrees, I brushed the turkey with a honey mustard glaze. I returned the bird one last time to the air fryer until it reached a temperature of 155-160 degrees F. At this point, the skin gets nice a crispy with the glaze. Yum. Remove the turkey and loosely cover with foil for 10 minutes. Now it’s ready to slice and serve. Unfortunately, the work is not quite over because you still have to cook the second half (the downside to a smaller air fryer). All in all, I have to say, this was a hit at Friendsgiving. 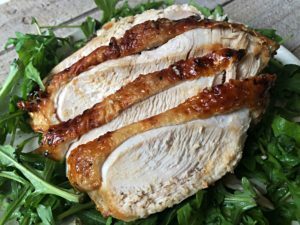 It was a quick way to cook up some extra turkey, without using more oven space, which was desperately needed for all of our tasty side dishes! I have a lot more experimenting to do with this little gadget, but so far, it’s a winner in my book. 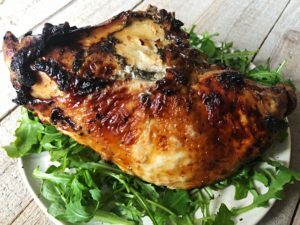 If you’re a fan of the air fryer, let me know what’s your favorite way to use it! Comment below! Using a good pair of scissors, cut down the center of the turkey to separate the 2 breasts. Note: if you have a large air fryer, you may be able to keep the entire turkey breast intact. Rub olive oil all over turkey breast. In a small bowl, combine chopped herbs, salt, and pepper. Rub herb mixture over the turkey breast. Transfer one of the halves to the air fryer and cook for about 20 minutes. Turn the breast over and cook for an additional 15 minutes. While the turkey is cooking, combine butter, honey, and mustard in a small saucepan over medium heat. 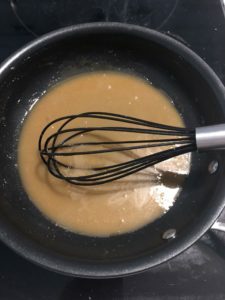 Once butter has melted, whisk to combine. 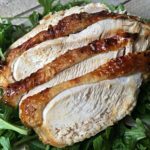 At this point, brush the entire breast with honey mustard glaze and return to air fryer for an additional 5-10 minutes until browned and crispy, and the internal temperature is 165 degrees F.
Repeat with the second half of the turkey breast. Loosely cover the turkey breasts with aluminum foil for 5-10 minutes before slicing and serving.